David was born in Bangkok, Thailand, in 1967. He received the B.Eng. degree (First Class honor) from Chulalongkorn University, and the M.S. and Ph.D. degrees from Stanford University, all in Electrical Engineering, in 1990, 1993, and 1997, respectively. During the spring of 1999 and 2000, David visited Professor Hidenori Kimura, Department of Mathematical Engineering and Information Physics, University of Tokyo. 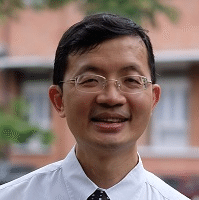 Since 1990, David has been with the department of Electrical Engineering, Faculty of Engineering, Chulalongkorn University. Currently, he is a professor of Electrical Engineering and serves as the coordinator of Control Systems Research Laboratory and deputy director of International School of Engineering. Office: Room 410, Boonrod Binson Bldg. Tel: (+662) 218-6487; Fax: (+662) 251-8991. Department of Electrical Engineering, Chulalongkorn University, 254 Phayathai Road, Bangkok 10330 Thailand.